There’s a moment late in The Way Way Back that helps define everything both right and wrong with the film. Fourteen-year-old Duncan (Liam James) is playing Candy Land with his mom Pam (Toni Collette), her boyfriend Trent (Steve Carell), and his daughter Steph (Zoe Levin). It’s raining outside, so they’ve holed up in their Cape Cod summer vacation home, biding their time until the weather clears. Duncan passes a shortcut on the game board, so Pam suggests he take it. But Trent correctly points out that he didn’t land on the shortcut by exact count. They argue momentarily over the acceptability of spontaneous house rules before Pam stalks off in tears. Obviously, she’s upset about far more than a children’s game that they’re all too old to be playing. Trent is suspected of having an affair with his friend’s wife (Amanda Peet). He’s also proven vaguely menacing and bullying toward Duncan. Emotions reach a boiling point in a scene that’s well written and acted. Unfortunately, co-writer/directors Nat Faxon and Jim Rash (Oscar winners for their 2011 screenplay The Descendants) don’t integrate the scene in any meaningful way. The details feel accurate, as if one or both of them had experienced something similar at one point. 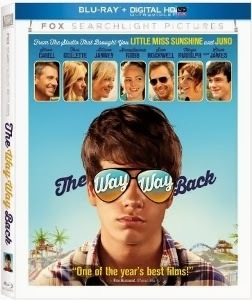 But like many of the best scenes in The Way Way Back, it plays like a strong vignette in search of a deeper movie. Aside from his disgust for his mother’s wishy-washyness and her boyfriend’s general dickishness, awkward Duncan figures out a way to have fun while suffering through a stifling family vacation. Every day he steals away to the local water park, where he befriends the gregarious, clownish Owen (Sam Rockwell) and his irritable love interest Caitlyn (Maya Rudolph). These co-managers allow Duncan to work there, despite his youth and lack of parental consent. Only at the park does the kid start to emerge from his shell, earning the nickname “Pop and Lock” after gamely demonstrating his total lack of dancing ability. The dialogue rings true, expertly played by the ensemble cast – which also includes Allison Janney as a perpetually tispy neighbor and AnnaSophia Robb as her daughter, Susanna. Duncan takes an interest in Susanna, who seems far more thoughtful than her bitchy friends (including Steph). As entertaining as it all is, not much happens and ultimately the characters don’t continue to resonate after the end credits roll. It’s packed with subtly effective moments, like that Candy Land scene, but it ends up feeling a bit hollow. Carell is good at playing a jerk, Rockwell is good at playing a nice guy, and James is believable as a shy teen. But in the end they all feel a bit one dimensional. The Blu-ray itself is fine, with a sharp, attractive presentation of John Bailey’s sun-baked cinematography. The 5.1 DTS-HD Master Audio mix is standard-issue, offering crisp dialogue but nothing of special note. Special features could’ve been more expansive. As it is, we get some deleted scenes and handful of behind-the-scenes featurettes that don’t probe too deeply into the origins or intentions of Faxon and Nash’s vision.